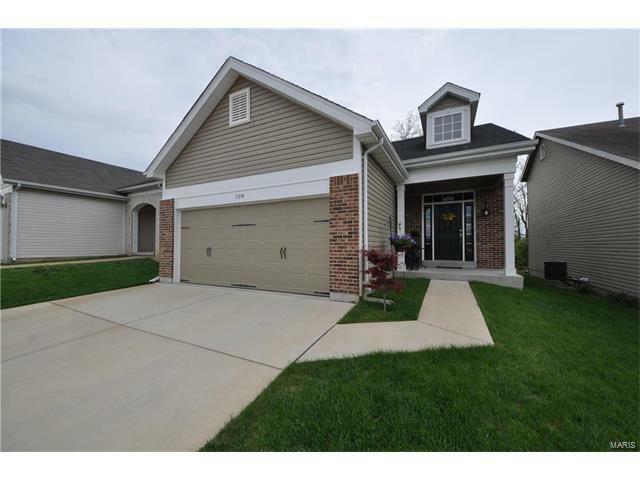 Upgraded 3 years young LIKE NEW 2 BDRM, 3 BTH ranch style home in gated community of Manors at Ridgeview backing to woods! Exterior feat brick front w/covered porch, upgraded 30 year shingles, oversized 2 car garage & patio backing to trees/woods. Breathtaking interior feat open floor plan w/engineered hardwood, 9 ft ceilings & TONS of natural light. Spacious living rm leads to breakfast rm w/bay window w/atrium door out to patio. Spacious kitchen w/pantry, upgraded dark 42" cabinets w/under cab lighting, SS appliances & extra cabinet space w/desk area. Main fl master bdrm suite w/walk in closet w/custom cabinet & luxury master bth w/dbl sink vanity, tub & sep shower. Add'l full bth and laundry on main. Upgraded spindled staircase leads to partially finished lookout lower level w/9 ft pour. Includes carpeted rec & family areas. 2nd bedroom w/egress window & closet and full bath in lower level. Storage space provided w/under stair & sep wrap around storage w/shelving in LL. MUST SEE! 255E to exit 2 onto Telegraph Rd. Turn right onto Telegraph Rd. Turn left onto Ridgeview Manor. Turn right onto Tournament Dr. Home is on the right.